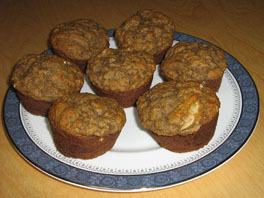 These delicious, healthy banana muffins are sure to please. In searching for a healthy snack recipe you may find muffins that claim to be easy, healthy snacks, however a quick glance at the ingredients reveals white sugar, white flour, and butter. Some even contain lard! Pass the Coumadin please! Ripe bananas are naturally very sweet, so no extra sugar is needed. This is a quick, healthy recipe that can even be used as a healthy dessert. Add the oil and the egg. Add the dry ingredients to the banana mixture, mix until just moistened. Bake at 350˚ about 25 minutes to 1/2 hour.